We just finished a solid week of windstorms and record rainfall. Seattle received its normal December rainfall in the first eleven days of the month. We were under high wind warnings almost every day during the week. Then last Friday, the weather gods relented and gave us a really nice day with sunny skies and moderate temperatures. 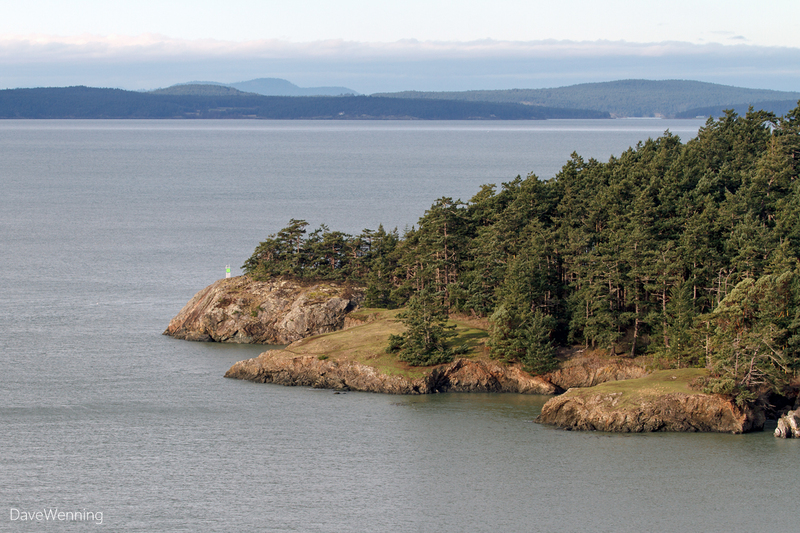 I had been itching to get outside, so I headed over to West Beach in Deception Pass State Park. My first stop was "Fraggle Rock" at the north end of the parking lot. As I expected, a parcel of Black Oystercatchers had gathered to preen and take a snooze. 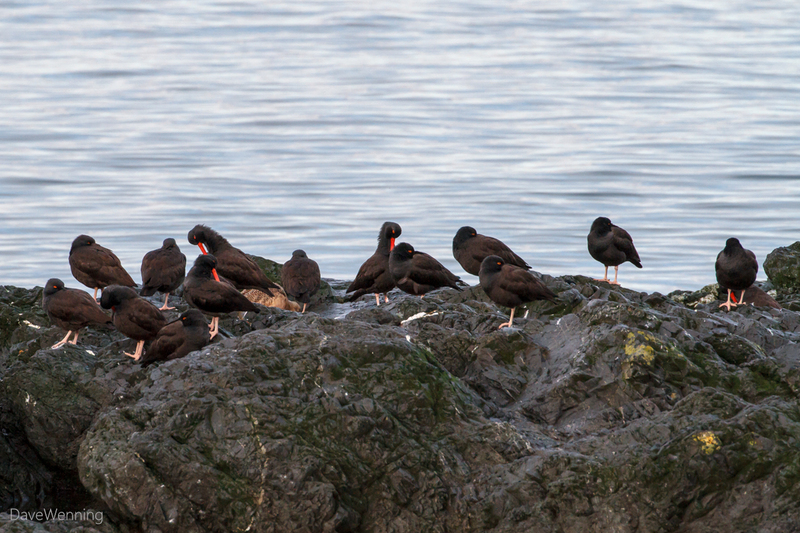 At the opposite end of the rock, these gulls had segregated themselves to the cool kids' table. 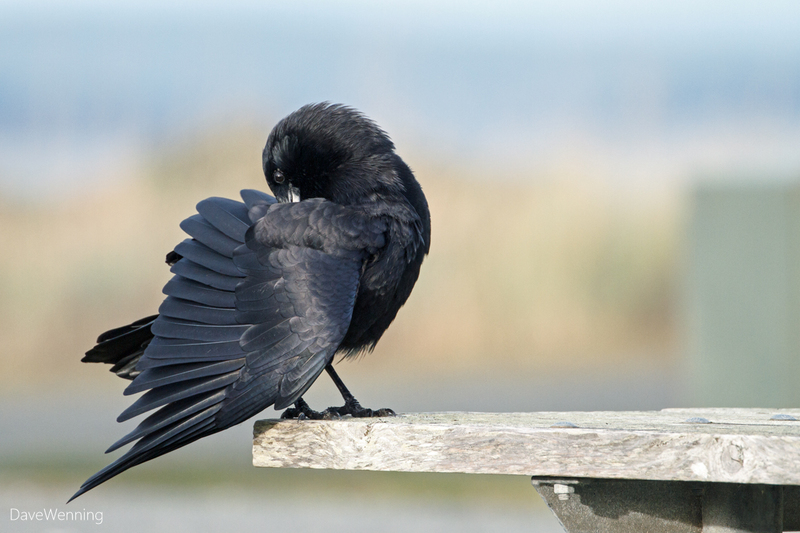 They were also here to rest and preen their feathers. 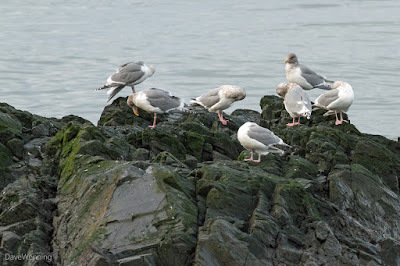 These appear to be Glaucous-winged x Western Gull hybrids, but I could be wrong. Gulls are hard. A short path leads over to the Amphitheater on the Deception Pass shore. 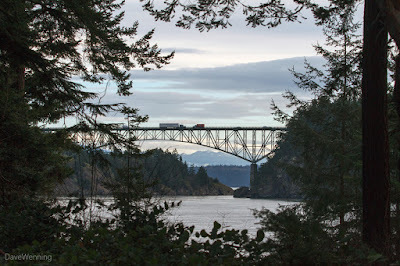 From the trail, I caught this view of the Deception Pass Bridge. 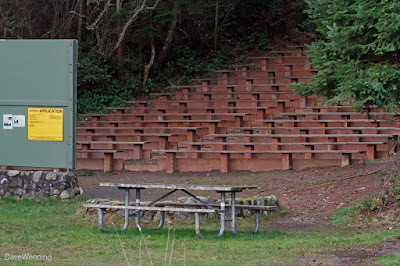 From the posted building permit application, it looks like they are planning to remove the movie screen and replace it with a covered stage. 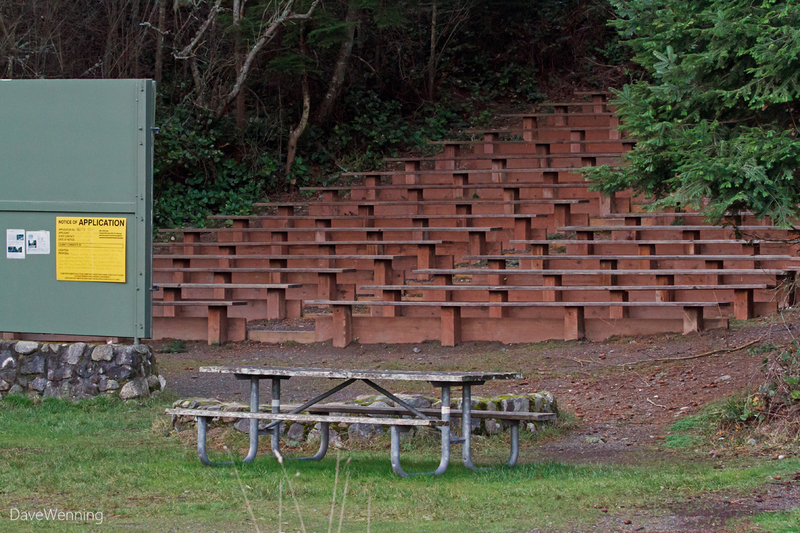 They have an eclectic variety of music concerts at the Amphitheater all through the summer. 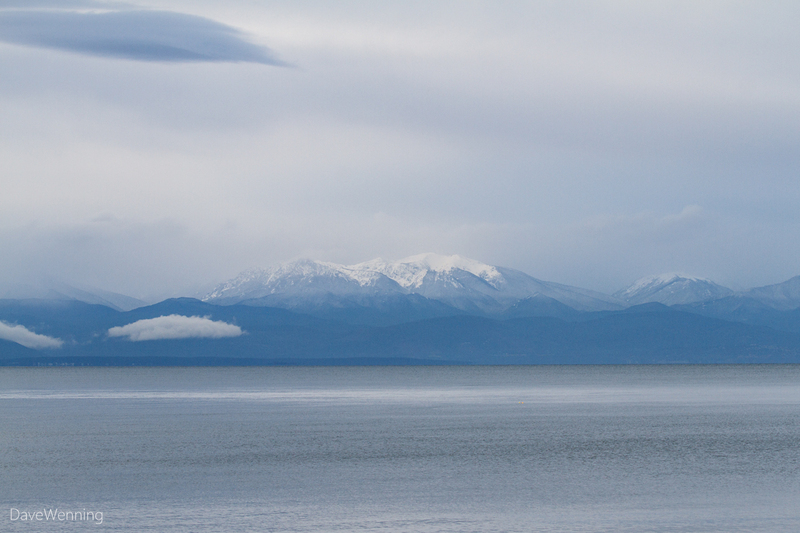 I moved to the opposite end of the parking lot and viewed the Olympic Mountains still engulfed in rainy weather. From where I stood, the mountains were about 50 miles (80 km) across the Strait of Juan de Fuca. It is common to see U.S. Naval aircraft in the skies over the park. 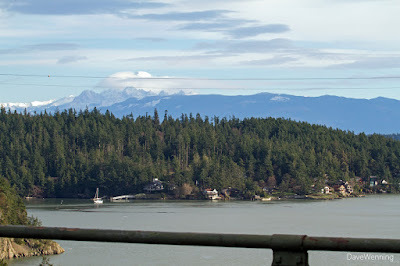 The Whidbey Naval Air Station is just down the beach to the south. Sometimes campers complain about aircraft noise. Keep in mind, however, personnel from the air base frequently volunteer to maintain trails and facilities in the park. 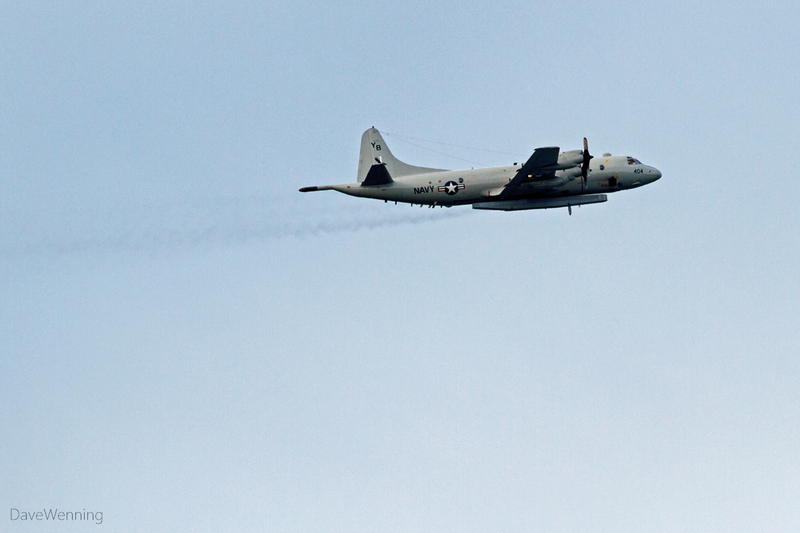 This is a P-3 Orion turboprop. Its mission is anti-submarine and maritime surveillance. 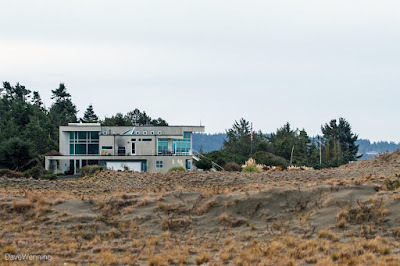 I headed clockwise around the Sand Dune Interpretive Trail. 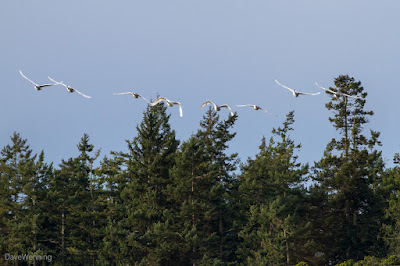 As I entered the Dune Forest, this is what I spotted directly above me. 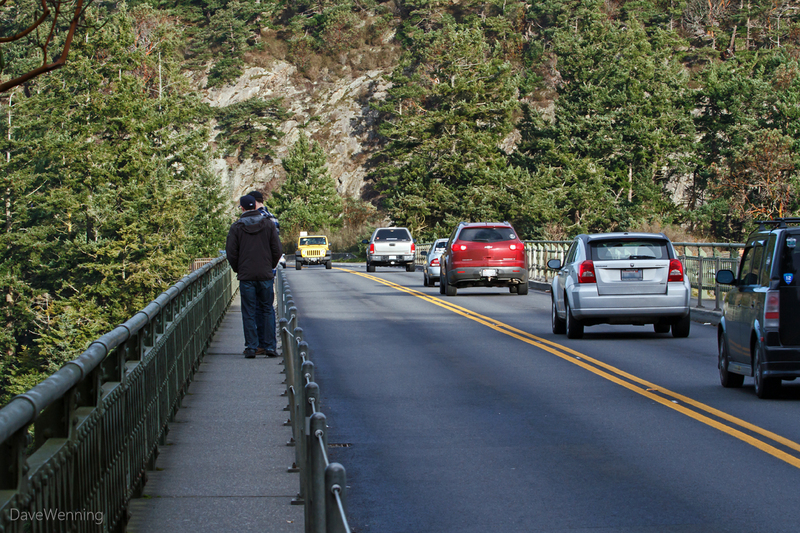 I wonder how many people walk this trail and never notice what is right over their heads. 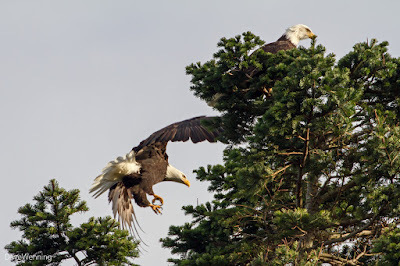 I see the resident pair of Bald Eagles here almost every morning I visit. I am fascinated by this house south of the park boundary. 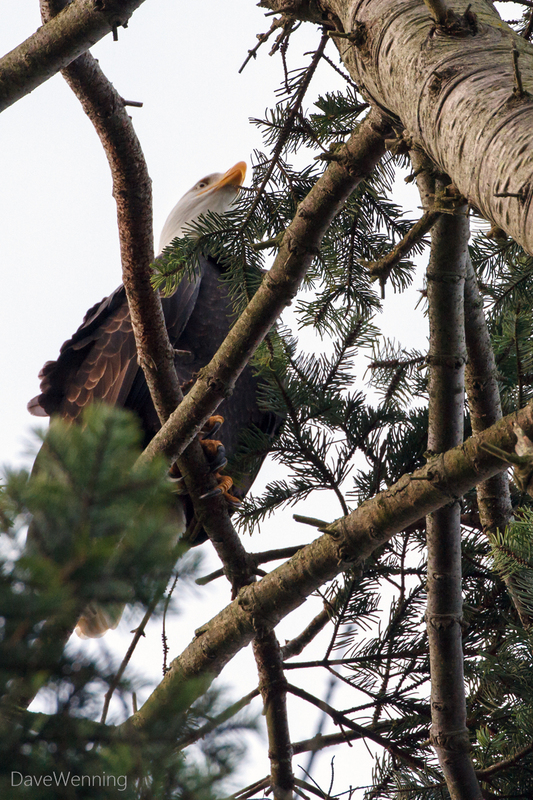 As I came around the other side of the Bald Eagles' perch, I got a better look at the pair together. 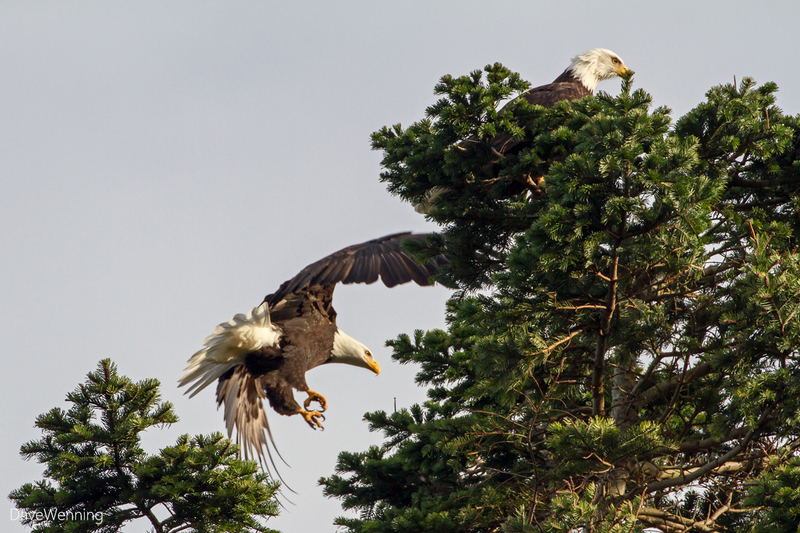 While I was photographing, the second bird suddenly moved to a higher branch to be closer to its mate. 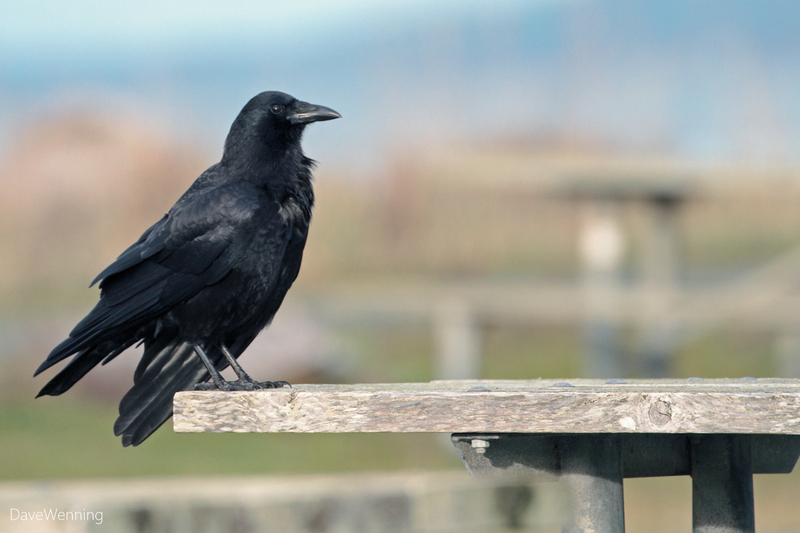 In the Cranberry Lake picnic grounds, this Northwestern Crow appears to be full of himself. 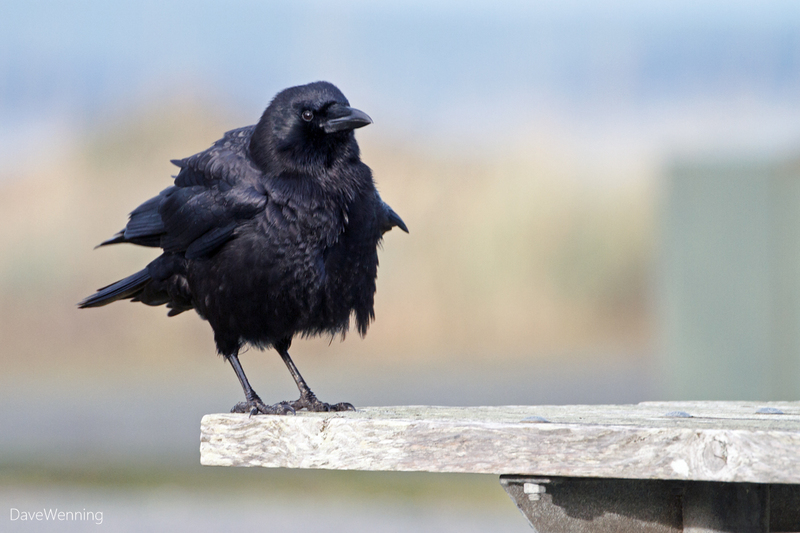 Fluffing and folding, it's a lot of work to be this handsome. On my way out of the park, I stopped at the head of the East Cranberry Lake Trail. 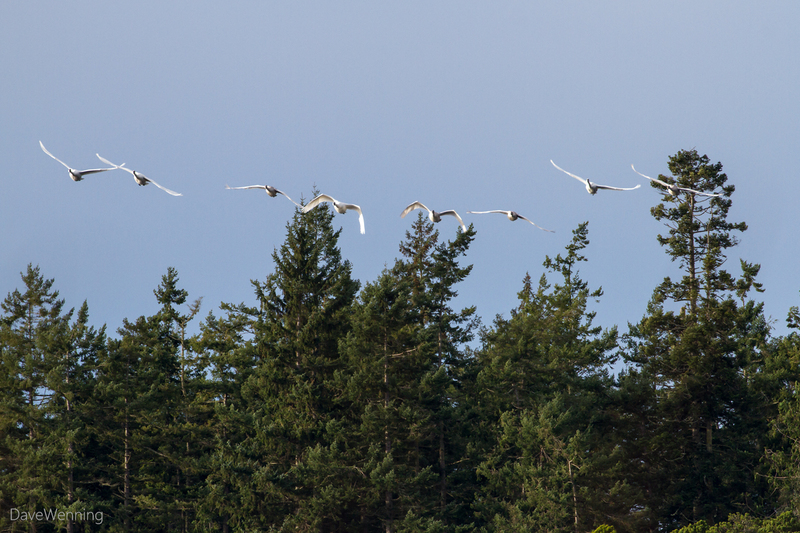 Hiking the trail, I caught this flock of Trumpeter Swans flying over the lake towards me. Heading back home, I made a quick stop at the bridge. From the deck, I could see a cloud-shrouded Mount Baker over Yokeko Point. On the other side of the bridge is Lighthouse Point in the park. I am told there was a real lighthouse here at one time. Now there is just a small mechanized navigation light. Beyond the point are the San Juan Islands. As usual, traffic was heavy on the bridge, even on a weekday. It was a beautiful morning with perfect weather to get outside and take some pictures. The next day, on Saturday, high winds and drenching rain would return for the weekend.